Posted: Tuesday, August 7, 2018. 8:29 am CST. By Richard Harrison: The people of Belize realize that 99.9% of us are not professional lawyers and historians…like those who promote the YES to ICJ vote (by fact or pretense)…offering up references to debateable complex laws, treaties and historical accounts of so-called “facts”…without reference to loopholes and exit routes that are natural to laws and courts, giving real meaning to “litigation risk”. The vast majority of voters of Belize are mostly with primary school literacy and are unfairly faced with this complicated-to-understand referendum challenge to their self-determination…so when they realize that the sophisticated art of deception and deceit is being served high with BS in an ice-cream cup…they will not be happy if they lose some sea and territory…and the sales manual itself says “no one knows where the lines will be drawn”. Is that not clear enough a caution statement? I simply dont share their iron-clad, water-tight ambition…with the nothing to gain, much to lose formula…not even the whiff of an investment package, but Guatemala is already promised US$2 billion investments from Israel (none of that can be diverted for other interests? )…coincidentally with excellent timing. Guatemala has nothing to lose, and any gain would be progress towards their final objective…because once you pay something small towards a bill, you are acknowleging the whole bill. At first there was a treshold of 60% voter turnout…this was removed at Guatemala’s behest…now there is no treshold…so if 3 people go to vote in the referendum and 2 vote yes…all 380,000 Belizeans will be dragged kicking and bawling to the ICJ slaughterhouse. A no treshold standard is not consistent with our Constitution, which requires 3/4 majority in the House of Representatives to alter the Constitution, Article 1 of which defines our borders. There is a very high level of concern for the behavior of the people leading the charge to the ICJ…that I hear daily from the many people I meet and talk to…the PM jumps up first and says YES…and shortly after the Foreign Minister calls those that would vote NO “crazy”…then he takes ALL the donated money for the so-called “education” campaign and spends it exclusively on promoting the yes vote…because “we are broke and have no allies”. Even the book being used as the sales manual for what it declares a last resort option…is not entirely true and sells fear…that “all negotiations were tried and failed”, and “if we dont go to ICJ there is risk of invasion”. Belizeans cannot see no gain but these people are pushing hard to get a yes vote…how does the optics of that affect you? The GOB continuously declare that they are going to the ICJ as a goodwill equal party, unbeknowned to the rest of the world, with unwanted Guatemalan military controlling our Sarstoon Island and river since 2015….and many documented incursions into Chiquibul and adjacency zone…with not a single official complaint to any international body…and with over 55,000 Guatemalans (15% of current population) given Belize citizenship in contravention of our Constitution…as part of a continuous corruption of our democracy…and being perpetuated by the current, on-going re-registration of voters. Going to any court as goodwill equal party forfeits the right of appeal (which we have been told)…but also the right to claim for loss and damages (which is kept as a hidden unknown)…a creepy crawly PROCESS that had us move from border, to adjacency line, to adjacency zone, to exclusive economic zone that gives up 9 miles out of 12…a measure that can be used as evidence of precedence of what level of concession we are willing to make..voluntarily. This process of retreat and appeasement moves to higher stakes, by changing a dispute into a legal claim at the ICJ…can you see the logical progression of such a process? can you almost predict the next steps? Big private Corporations like Google and Al Jazeera now appear to be cooperating with the attempted legal claim…having changed our border from hard line to dotted line…or including maps in international broadcasts that show Belize as part of Guatemala….eroding Belize’s independence and sovereignty in the minds of billions across the world. The fact that we are not paying our way, for such an important decision, does not sit well with me..for the simple reason that I believe that “he who pays the piper calls the tune”. I sense distance between us and principal allies, especially UK, USA, and Israel…cooperation budgets have been cut by all of them as proof….instead of an Ambassador as before, the US embassy in Belize is now headed by a Charge d’Affairs…a downgrade. Belize is overloaded with outstanding debts, the least of which are the financial ones…a country well on the path to ROGUE state…our allies are calling our attention yet again…they have been doing so for years…asking us to reduce money laundering, facilitating tax evasion, pirate shipping registry, drug trafficking, human trafficking, crime, poverty, democracy, human rights….and it all gets worse with each passing year. We must say NO to ICJ now….with justification…not snubbing….and ask for a reasonable time to engage in new economic, judicial and political reforms…that takes us off the path to ROGUE state…and puts us on a rapid development, Singapore-like pathway…we must align our foreign policy based first on the best interest of independent and sovereign Belize, and second with the best interest of our allies…what sense is there in declaring Israel our enemy?….we should make clear commitments to change…regardless of which political party is in power…calculated and negotiated to conquer or neutralize those forces acting against our best interest…at their source. We should undertake broad and deep cooperation, coordination, collaboration, cohesion and even collusion with Guatemala…already 74% of them showed no interest in the claim of their oligarchy/military over Belize, by not going to vote in their referendum. As an example, if the $8 million given to Belize to promote the yes vote were used for English and Spanish teacher exchange, 200 teachers in each direction for two years is a conservative estimate…host families cooperation could double that number. This could impact millions in Guatemala high schools…and that 74% will grow rapidly…until when their leaders have no reason to keep the claim in their Constitution. No negotiations of this scale and scope, that benefit a wide range of people, have been tried before. 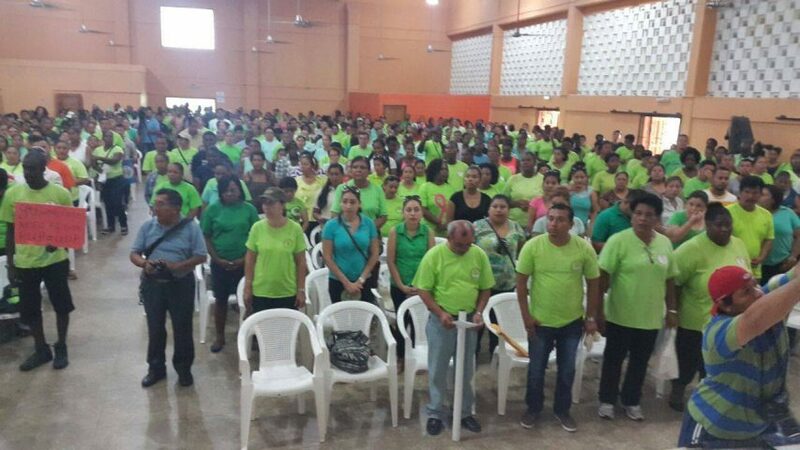 This is why UNITY of 15,000 in Belmopan on September 21 is so important to the future of independent and sovereign Belize…because only the power of the people can channel our country in the required direction. SELF-DETERMINATION does not require inaction.